Here is the north, this is where it lies, where it belongs, full of itself, high up above everything else, surrounded by everything that isn't the north, that's off the page, somewhere else. I was astounded at how similar Paul's early life was to mine. Jodrell Bank was discussed 350 pages before this! Yet it is more than just an ox-stunning tome. Its a very well written and indeed hefty tome, that still manages to convey both depth and breadth quite well. Morley's style divides opinion, but it suits a book like this down to the ground; his love of digression and his delight in variety animate the sprawling, discursive text. Bob, I believe was the legendary Bill Shankley's brother who to my knowledge had no personal association with the North apart from his brother. No matter what you think you know, or believe about the North, if you read this, it will surely affect your thoughts in some way A curious book this. At just short of 600 pages, Paul Morley makes a fair stab at including everything, or at least everything he can find that's relevant to his own personal concept of 'The North'. It was for him, as it is for millions of others in England, an absolute, indisputable truth. I recommend you to listen to the full audiobook The North: And Almost Everything In It , free at our library. This didn't bother me as I was born and brought up 3 miles from Morley at around the same time so there was much of interest in the book for me, but I guess most readers will buy it thinking it is one thing only to find out it is something totally different. And he invites us all to do the same. And I love the little asides; they are more than digressions or tributaries to the abandoned slip road in the sky just off the Mancunian Way. Morley's style divides opinion, but it suits a book like this down to the ground; his love of digression and his delight in variety animate the sprawling, discursive text. Ambitiously sweeping and beautifully impressionistic, without ever losing touch with the minute details of life above the M25, The North is an extraordinary mixture of memoir and history, a unique insight into how we, as a nation, classify the unclassifiable. 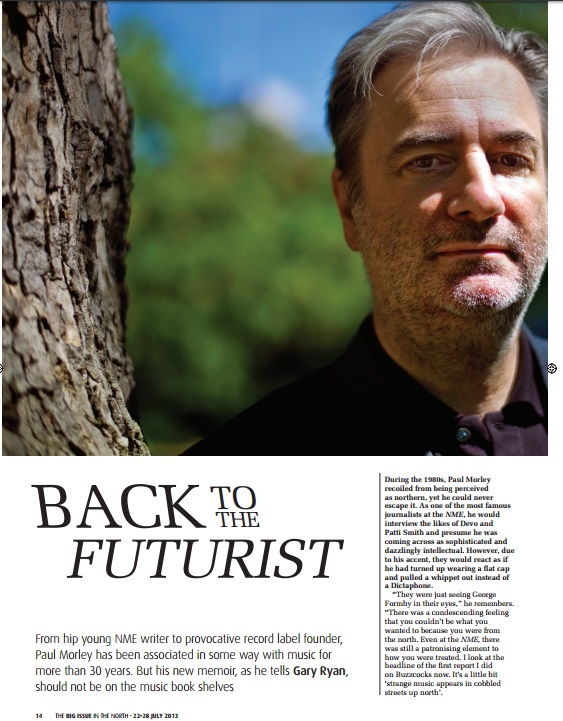 Paul Morley grew up in Reddish, less than five miles from Manchester and even closer to Stockport. Ever since the age of seven, old enough to form an identity but too young to be aware that 'southern' was a category, Morley has always thought of himself as a northerner. It's innovation, entrepreneurship and radicalism. A sprawling book - which is more Paul Morley's biography than it is any kind of assessment of the North. This is actually more memoir than the title really suggests and as such focuses on Stockport and Manchester plus to a lesser extent, Liverpool , there are sections of history woven in, going back through time, and these were the most interesting parts but lacked any kind of narrative thread. At that length, it's a fine achievement that this book, which I read on Kindle, doesn't seem as long as that and given the variety of content covered I maintained interest throughout. I don't know Reddish and know Stockport only slightly, but our years growing up do meet in the centre of Manchester. I have to say it's very north-west focused, not as much about the other side of the country, but I enjoyed that as it's closer to where I'm from. North Reddish is part of Reddish, is part of Stockport, is part of Manchester, is part of Lancashire is part of the North etc etc. Saying that however there are some large gaps that you would expect to be on, that aren't. I learnt a lot of interesting facts, read a lot that I previously knew, but it's presented with real heart and feeling. If you want a personal but more readable account look to Stuart Maconie or Simon Armitage's books on similar themes. Morley's style divides opinion, but it suits a book like this down to the ground; his love of digression and his delight in variety animate the sprawling, discursive text. Reader: Paul Morley, with additional readings from Paul HiltonAbridger: Viv BeebyProducer: Justine Willett. Like industrial towns dotted across great green landscapes of hills and valleys, Morley breaks up his own history with fragments of his region's own social and cultural background. It was for him, as it is for millions of others in England, an absolute, indisputable truth. I learned something on pretty much every page. He is the author of a number of books on music - Ask: The Chatter of Pop, Words and Music: A History of Pop in the Shape of a City, Joy Division: Piece by Piece and Joy Division: Fragments - as well as an acclaimed memoir of his early years, Nothing. A lifelong fan of Manchester City and The Smiths. Bob, I believe was the legendary Bill Shankley's brother who to my knowledge had no personal association with the North apart from his brother. Ambitiously sweeping and beautifully impressionistic, without ever losing touch with the minute details of life above the M25, The North is an extraordinary mixture of memoir and history, a unique insight into how we, as a nation, classify the unclassifiable. What all in The North might agree on though is accent. At that length, it's a fine achievement that this book, which I read on Kindle, doesn't seem as long as that and given the variety of content covered I maintained interest throughout. Very entertaining and very informative. Hypnotic and infuriating in equal measure. What that meant, he wasn't entirely sure. At that length, it's a fine achievement that this book, which I read on Kindle, doesn't seem as long as that and given the variety of content covered I maintained interest throughout. He tended to speak to the camera with commitment and authority, and he has continued in that vein here. If you want a personal but more readable account look to Stuart Maconie or Simon Armitage's books on similar themes. It took me a long time to read, but it is about 550 pages, and non-fiction, so I would read it for a few days, put it down, read something else, and come back to it.